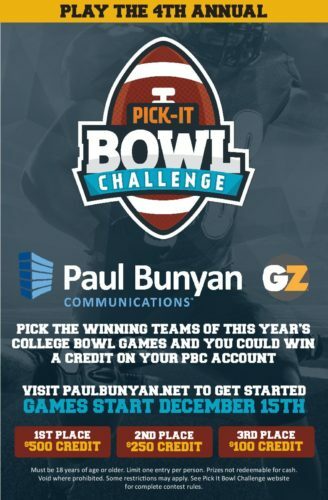 Get in to win up to a $500 credit on your PBC account with the 4th Annual Pick It Bowl Challenge! Get in to win with the 4th Annual Paul Bunyan Communications Pick-it Bowl Challenge, a free online contest for participants to pick the winners for the 2018-19 College Bowl games for a chance to win a credit on a Paul Bunyan Communications account. The top 10 finishers will win a credit on their Paul Bunyan Communications account. First place winner will receive a $500 credit, second place is a $250 credit. The first official College Bowl game this year is December 15 so be sure to register and make your picks by December 15 for the best chance at winning! The Pick-it Bowl Challenge is a fun and free way to interact with others in northern Minnesota and enjoy a little friendly competition. Must be 18 years of age or older. Limit one entry per person. Prizes not redeemable for cash. Void where prohibited. Some restrictions may apply. See Pick It Bowl Challenge website for complete contest rules.